The virtual browse feature, shown in the screenshot here, displays the covers of surrounding books on the shelf. Emory Libraries and Information Technology Services made a number of improvements over the Thanksgiving break to the Emory Libraries' discoverE catalog search system, including virtual browse, a feature that displays a virtual bookshelf of items on the shelf near the target of your search – as though you're standing in the stacks aisle. 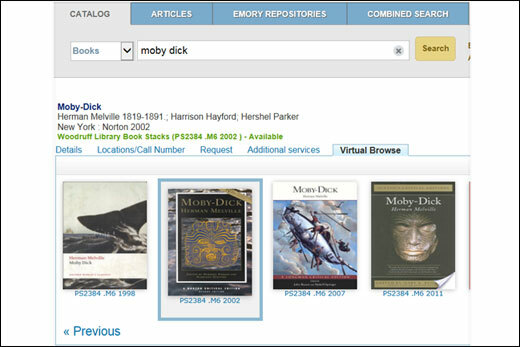 Virtual browse works on any item with a call number, and it works for all Emory Libraries – Woodruff and the Manuscript, Archives, and Rare Book Library, as well as Oxford and the business, health sciences, law and theology libraries. Patrons can browse forward and backward through the covers of books and other items as if they were displayed on the shelf. "It's like you're walking through the stacks aisle and you have the ability to see what's close by," says Christopher Spalding, library core services manager. Humanities librarian Alain St. Pierre says the virtual browse feature will help students discover additional research resources. "Students will be able to see what other books are relevant to their topic without having to go up into the stacks," he says. "They also will be able to browse the shelves of several Emory libraries at once." Spalding says faculty members have been requesting this feature for a while, but it may be the students who use it the most. "It creates an environment for spontaneous discovery," he says. "I remember spending hours in the stacks, just finding things. I think that's what students miss, discovering things you may not have originally searched for." And newly acquired, a refine-search capability that allows users to limit results to materials acquired by the library within the last 60 days.